France-based language service provider (LSP) Ubiqus has acquired boutique local rival Gedev. The deal closed in October 2018 and was financed with a mix of cash and debt. In-Extenso Deloitte advised on the deal, the terms of which were not disclosed. Gedev was founded as early as 1972 and services customers across the highly technical aerospace and defense sectors, as well as a few other specialized sectors. Prior to the acquisition, Gedev was part of the Ortec / Sonovision group, which has its roots in technical documentation, as is based in Bagneux on the outskirts of Paris. With USD 82.6m in 2017 revenues, Ubiqus is one of Europe’s largest LSPs. The company focuses on transcription, summarization, and translation services for clients spanning marketing, communication, law and finance and the medical sector. At SlatorCon Zurich 2018, Ubiqus CEO Vincent Nguyen spoke to the audience about the company’s continued investment in technology, including neural machine translation, in recent years. He also shared that Ubiqus is one of the main contributors to the OpenNMT project, along with Systran and Harvard NLP. 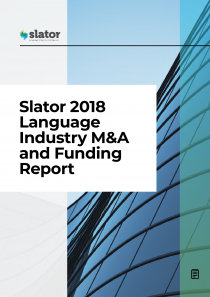 Slator reached out to Nguyen to find out more about the rationale behind the acquisition. Nguyen told Slator that “matching [Gedev’s] client base and specific markets expertise with our technology can drive growth, quality and fast turnaround times.” For Ubiqus, therefore, Gedev opens up a new customer base in these niche verticals, to which the combined company can now begin to apply its technology solutions. Asked how Gedev and Ubiqus were introduced, Nguyen told Slator that “our expertise in NMT is well recognized and many smaller LSP contact us,” suggesting that it was Gedev who approached Ubiqus for a potential buyout. It also appears that there was a prior relationship between the two companies, since Nguyen confirmed that Ubiqus will retain Ortec / Sonovision Group as a customer: “we will continue to serve the Ortec / Sonovision Group with our linguistic services,” he said. 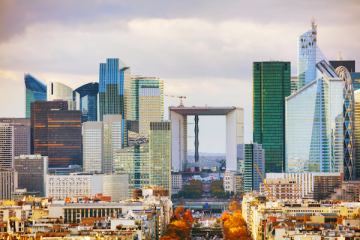 Gedev will relocate its 20 staff to Ubiqus’s La Défense (Paris) offices before the New Year, Nguyen added. Among them will be Philippe Monfort, Gedev’s Director of Operations, who Nguyen said now “joins the Ubiqus Management Team.” Ubiqus’s staff of more than 500 are located throughout Europe (France, United Kingdom, Belgium, Ireland and Spain), the United States and Canada. Nguyen declined to comment on Gedev’s 2017 figures or the combined company’s 2018 projections. The CEO did disclose, however, that he expects “EBITDA for both Ubiqus and Gedev to be “in the 20% range” for 2018. According to regulatory filings for Gedev SAS, the company generated sales of EUR 3.0m for the year ending December 2017, down 14.2% from EUR 3.5m in 2016. The same source indicates that the net profit was EUR 0.42m for 2017, down from 0.44m in 2016, meaning EBITDA for Gedev was at 14% of revenue in 2017. Given that Gedev was a part of the Ortec / Sonovision group at the time, however, those figures may not provide a full picture of Gedev’s financials. As with Ubiqus’s two 2017 acquisitions, Celer Soluciones and Poliglota, it is expected that Gedev will be integrated into the Ubiqus brand in 2019, along with Textualis, a Canadian LSP, which the company acquired earlier in 2018. On industry-wide drivers of M&A, Nguyen said that the rationale for the “many deals” happening in the industry can be boiled down to “two possible triggers.” On the one hand, “medium to large size [companies] want to take advantage of the high multiples for their valuation, and smaller companies realize that they can’t really invest in technology and look for a good partner that can help them to raise their value,” he explained. Meanwhile, it’s no secret that big tech companies, including Google and Amazon, are also pouring their own hefty investments into developing and selling NMT solutions. Having shared a stage with Google’s Francesco Bombassei at SlatorCon Zurich 2018, Nguyen remains refreshingly unconcerned by this potential tussle for technological leadership. “SlatorCon Zurich was ideal to have a view on both aspects. Google’s research job is fantastic, so is Facebook’s, Amazon’s, …,” he said. 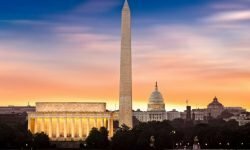 Nguyen believes that the presence of the tech giants in the NMT space is, in fact, “good for LSPs” since although “they are so powerful that they can hire tons of researchers,…fortunately for us they don’t really know about the actual job of being an LSP.” There is room for everyone, therefore, since “even people at Microsoft, Google, Amazon will still outsource millions of words themselves,” he added. As for Ubiqus’s own NMT capabilities, the company has spent the past 18 months rolling out NMT to its operations, and now also hosts a free online translator, similar to the likes of language technology startup DeepL, whose website traffic has soared since its launch. Of the online translator, Nguyen said that “Ubiqus.io is our e-commerce website, for people that want to use a fast turn around, affordable priced service.” The company “wanted a window to show what we can do in NMT. We discovered that some people used [it] with hundreds of thousands of word so we had to limit the usage” and the site now has two options – an “open to all” translator and a “business users only” translator. To access the business translator, users must obtain a disposable token that is valid for translation of one document in exchange for entering their email address. “It’s a one-doc token to show how the docx-to-docx work. It renders a fully formatted translated document,” Nguyen said. Both Ubiqus and Gedev already use the same productivity (CAT) tools in SDL Studio and Groupshare, so the bulk of the work of merging technology will come in efforts to roll out Ubiqus’s NMT technology to Gedev’s operations. 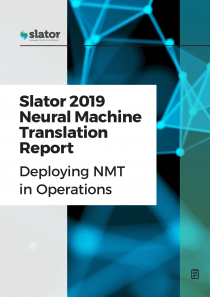 For more insights on how NMT is being used in operations, download the Slator 2019 Neural Machine Translation report.